As one of its first official acts, the new “national unity” government of President Ashraf Ghani Ahmadzai is set to sign a Bilateral Security Agreement with Washington allowing 10,000 US occupation troops to operate with impunity on Afghan soil after the formal end of US-NATO combat operations at the end of this year. White House counselor John Podesta, who headed up a decidedly low-ranking US delegation to Ghani’s inauguration ceremony Monday, made the announcement on the troop deal, which is to be signed formally by the US ambassador and an Afghan government official in Kabul today. Washington had been working for nearly two-and-a-half years to secure such an agreement, which would guarantee the Pentagon continued use of Afghan military bases and, crucially, ensure that US personnel remain immune from prosecution in Afghan courts for any crimes carried out against the Afghan people. Despite threats of a complete pullout and cutoff of aid, President Hamid Karzai, who headed a puppet government in Kabul for 13 years after being installed by Washington, refused to sign the deal. He insisted that the US would have to agree to end aerial bombardments and special forces night raids, which have claimed the largest share of civilian casualties inflicted by the US-led occupation forces. Ghani, a former World Bank economist who spent 24 years abroad, most of them in the US, before the American invasion of Afghanistan, apparently has failed to raise any such criticisms or demands. While the Obama administration has stressed that the 10,000 troops will be engaged in advising and training the 350,000-member Afghan National Army, the reality is that special operations forces will remain in the country, continuing to direct air strikes and assassination raids against elements deemed hostile to the US and its puppet regime in Kabul. In the run-up to the 2012 US election, President Barack Obama had promised that he was “bringing our troops home from Afghanistan” and that he would “have them all out of there by 2014.” This new deal, however, sets the stage for an open-ended military presence in the impoverished country, even as the US administration is launching a new war in Iraq and Syria and beefing up military forces for confrontations with Russia and China. If anything, the new Afghan government has even less credibility than the last. It is the product of an election held earlier this year that is universally acknowledged as rigged, with ballot stuffing on an industrial scale. It is widely believed that Ghani’s supposed victory is the result of some two million fraudulent ballots being added to the total. After the refusal of Ghani’s rival, former Karzai foreign minister Abdullah Abdullah, to accept the outcome of the runoff election last July, Washington brokered a deal to carry out a recount. As the European Union’s election inspection team concluded in a report issued last week, however, the recount was “inconsistently and hastily applied under high political tension,” leading to “an imperfect effort to separate fraudulent votes from clean votes.” In less diplomatic terms, the recount was just as rigged as the vote itself. With the threat that Ghani and Abdullah would form two rival ethnically based governments, posing the threat of a new civil war on top of the ongoing insurgency by the Taliban and other armed anti-occupation groups, Secretary of State John Kerry issued an ultimatum demanding that the two form a national unity government or face the cutoff of all US aid. Foreign assistance, the largest share of which comes from Washington, accounts for two-thirds of the Afghan regime’s funding. This deal has Ghani installed as president. Though it is widely believed he actually lost the election, his World Bank background made him a favorite of the US and its Western allies. Abdullah has been named to an extra-constitutional position of “chief executive officer” created in a decree signed by Ghani Monday. This ill-defined post has been described as something akin to a prime minister, but with some executive functions. Abdullah reportedly almost skipped the inauguration because of anger over the violation by Ghani’s supporters of an agreement not to make public the vote totals tallied in the rigged recount, awarding Ghani a 55 percent majority. Abdullah reportedly enjoys considerable support in the predominantly Tajik officer corps of the Afghan military as well as from the warlords of the Northern Alliance. Should these layers prove dissatisfied with their share of the power and the spoils, Ghani’s tenure may prove short-lived. Prospects for the new “national unity” regime appeared grim even at the outset. As the new president was being sworn in, Taliban bombers struck at a checkpoint on the Kabul airport road leading to the US Embassy, killing four members of the Afghan security forces and three civilians. In a separate attack, a suicide car bomber struck a government compound in Paktia, killing at least eight people, including several security personnel. Just three days earlier, Taliban forces overran a strategic district in the central eastern province of Ghazni. Nationally, the Taliban has mounted its most aggressive offensive since its government was toppled by the US invasion of 2001, taking control of large swaths of territory in the south and east of the country that had previously been held by US-led occupation troops. The attacks by the group have claimed the lives of more than 2,000 members of the Afghan security forces just since spring, double the number killed during the same period a year ago. Meanwhile, the government’s fiscal crisis was made clear by an announcement from the finance ministry on the eve of the inauguration that it is unable to pay the salaries of hundreds of thousands of government employees this month because there is not enough money in Afghanistan’s treasury. 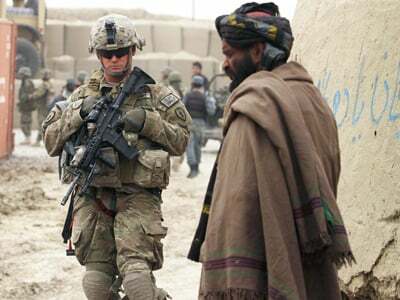 The Afghan government has asked for $537 million in emergency funds from Washington to enable to continue operations. According to Reuters, the US ambassador, James Cunningham, said that any such allocation would be borrowed from next year’s donations and be contingent on the government implementing austerity measures along with plans to increase revenue collections. “There isn’t going to be new money,” he told the news service. The US government has poured in more than $104 billion over the past decade with little to show for it. Amelioration of grinding poverty is marginal at best, and there are widespread fears that the Afghan security forces will prove no more capable than their Iraqi counterparts. The lion’s share of the cash has gone into the pockets of corrupt Afghan officials and US military contractors. In other words, what is envisioned is an open-ended continuation of the 13-year-old US war and occupation.